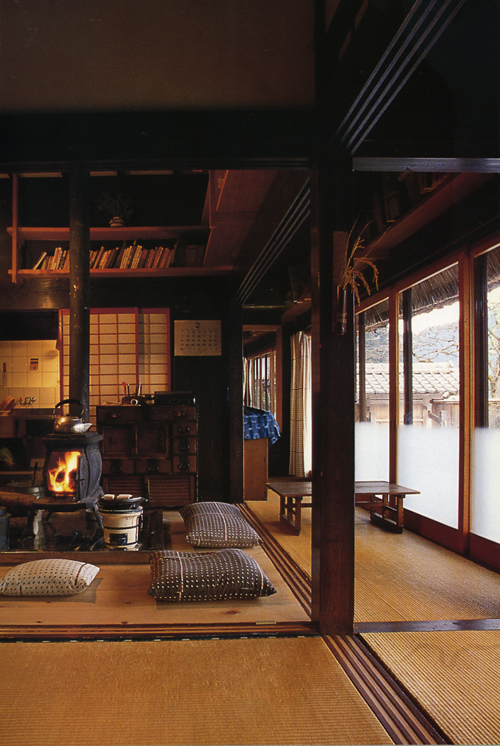 The photo above shows the central living area of a rural farmhouse on the border of Tochigi and Ibaraki prefectures. 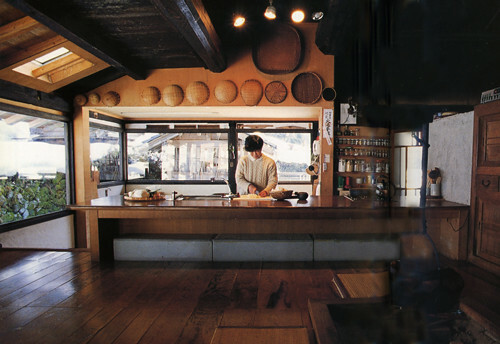 The house was restored by Kenji Tsuchisawa who bought it as a rundown heap when he was only 20, after seeing a photograph of a traditional Japanese farmhouse on a Tokyo magazine cover. He bought the house before realizing it was situated just one village away from the house in the magazine. Both photos above show the traditional indoor fire pit known as an irori, which sometimes sits on a raised seating platform, though in the photo above the irori has been traded for a more efficient (and safer) wood stove. The beautiful half-frosting on the glass screen doors in the photo above provides some privacy from the fairly public courtyard for people seated inside. 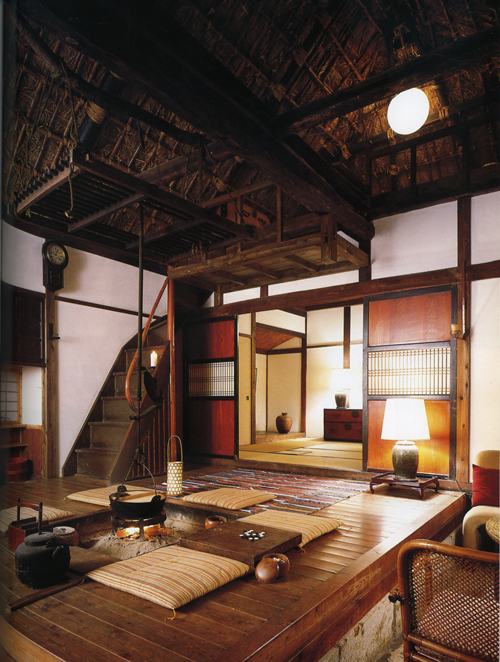 Photos are from a book I think is really worth buying: Japan Country Living : Spirit, Tradition, Style, by Amy Sylvester Katoh, photographs by Shin Kimura, Charles E. Tuttle Company, Rutland, Vermont and Tokyo, Japan, 1993. Kimura’s work has also appeared in Met Home and Paris Vogue. 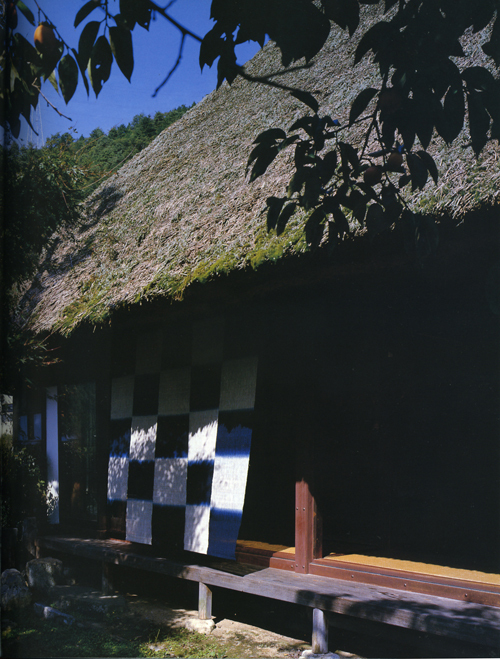 Above is a checkerboard textile of indigo-dyed, handwovern hemp by Hiroyuki Shindo, on the verandah of his thatched house. 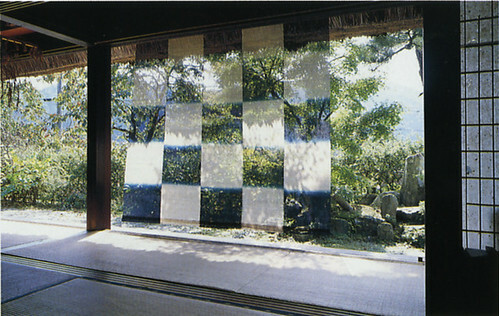 It provides privacy (it appears opaque from outside, below) and yet from inside it admits light and the view. Below, a functional modern kitchen produced by making only minor changes to the original. This entry was posted on Thursday, April 2nd, 2009 at 9:57 am	and is filed under architecture, design, favourite, interiors. You can follow any responses to this entry through the RSS 2.0 feed. You can leave a response, or trackback from your own site. beautiful. i know i will be straight onto amazon.com thanks to your book recommendation! I have always been curious about the functionality and utility of the Irori (which I never knew the name of untill now 🙂 ) It was a very useful article, thank you!